The Coward, this Norman Rockwell painting, appeared on the cover of Life Magazine published April 10, 1919. An alternate title for this illustration is Girl Kissing Soldier. This was the sixteenth cover by Rockwell to appear on Life Magazine. A Rockwell painting appeared only twice on Life magazine's cover in 1920 and twenty-eight times in all. Here we see more of Norman Rockwell's famous sense of humor and irony. Even the title is funny. 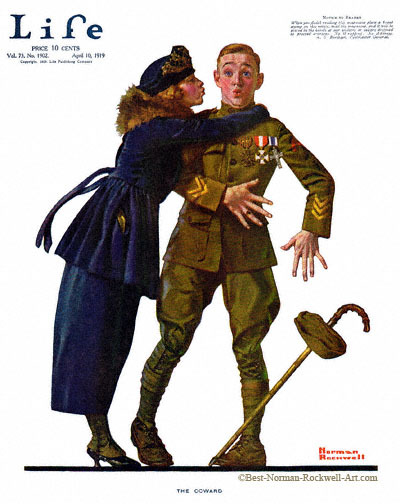 Rockwell has depicted an American soldier returning home from World War One. Armed hostilities had completely ceased by April 1919. Many of the soldiers had arrived back home by the publication date. This soldier wears many medals. He has been decorated for heroism. He has earned three stripes on his sleeve. He carries a cane, so he may have been wounded. This young man is certainly no coward. And yet, when this young lady tries to kiss him, he looks surprised, startled and, yes, even frightened. We do not know if he has met the young lady before. His expression signals us that he was not expecting her kiss. Why, he even dropped his cane and cap! The young lady was dressed in her best. Dressed to the nines! So she was hoping to kiss someone. The belt on her coat has flown behind her and is now settling. This suggests that she ran up to him and threw her arms around him. Well, the boys are back home.